Want To Win A Custom Laird Frame? 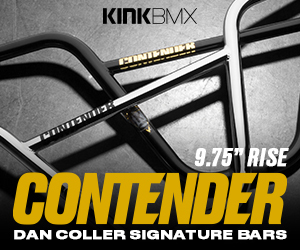 Have you ever wanted a custom built BMX frame with your exact specs and geometry, but couldn’t afford the higher price tag? Well, you’re in luck because Dustin Grice just hit us up with news that he’s giving away a Laird Frame to one lucky subscriber / commenter on his Youtube Channel. Below is the video and the details on what you need to do to win your own custom frame ($450 value)… It’s free, it’s easy… Why not give it a shot? Details below! If you have ever visited Minnesota to ride, there’s no doubt that somebody had mentioned The Factory to you as a spot to check out. Dustin Grice and Evan Moyle started the place in 2011 and it’s grown and evolved ever since. To celebrate 6 years, they have announced that the place has expanded to nearly 3 times the size with an all new “trails” section with boxes, hips and rollers. Hit play to get a look at it all and expect to see plenty of footage from this place in the near future. Last Monday, during the Monday Night Football game between the Minnesota Vikings and the New York Giants, there was a BMX demo that went down during half-time to keep the crowd excited and to help hype up the X Games that will be going down at the new Minnesota Vikings stadium in Minneapolis. Here’s two videos giving us a look at what the crew who were invited to do the show got into during the day (Chad’s video below) and some footage from the show up top (Dustin’s video). Can’t imagine what it was like riding in front of so many people! Dustin Grice and Matt Ford decided to take a break from BMX and sneak into Buck Hill in Minnesota to take their Fat Bikes through their terrain park and half pipe bright and early, along with a handful of other guys like Glenn Dussl from QBP. They didn’t exactly “sneak in”, but it’s still pretty wild. Dustin pulled out the GoPro to film the action so we could see what went down! Matt Ford is a crazy guy… Check it out. Who would love to do this? This is rad. Dustin Grice and a few others made a trip from Minnesota out to the Nowear Compound to catch a session on all the ramps and dirt jumps. Dustin pulled out the camera to document the riding from some of the young guns and the “old guys”, too! Take a look! “Located right in the very center of the United States, lies a little gem in the middle of nowhere called the “NoWear Compound”. Created by NoWear Extreme Rider AppareI in the state of Nebraska, this place is jam packed full of outdoor ramps, dirt jumps, and even a whole Barn filled with indoor ramps. Join our day as we make a surprise stop at the NoWear Compound with little 6 year old Isaac Zimmer and 9 year old Reed Bleymeyer. Check out NoWear BMX Extreme Rider Apparel and their “BYOB BMX Contest Series” online at http://www.nowearextremeriderapparel…. Riders: Reed Bleymeyer, Isaac Zimmer, Evan Moyle, Kyle Heaser, Dustin Grice. Dustin Grice and the Lil’ Pros BMX Tour headed to Joyride 150 to catch a session with a ton of the young guns that turned out for a big session! As always, it’s so rad to see just how good the up and coming generation is getting. This BMX video is clear proof of that! Enjoy! The latest stop of the Lil Pro’s BMX Tour hit the iconic Gorge Road Trails in New Zealand! Watch at a ton of the young guns that call the place their local trails have a ton of fun riding the jumps and showing you just how good the future of BMX really is! This video is packed full of gold! Dustin Grice just dropped a pretty interesting Video Bike Check up on his Youtube page for us to check out. About a year and a half ago, while he was at Adrenaline Alley, he built up a brand new bike. This bike check is interesting because it follows up a year and a half later at The Factory to show how well the bike has held up since. There are some guest appearances from Alex Coleborn and Mark Webb in this as well. Take a peek at the bike and some real solid riding in this BMX video!